While watching the Northern Lights, let your imagine run wild and create different pictures in the display of lights across the sky above Churchill, Manitoba. This picture could be of a large genie escaping from his bottle ready to grant somebody three magical wishes which has been opened somewhere on the outskirts of town. 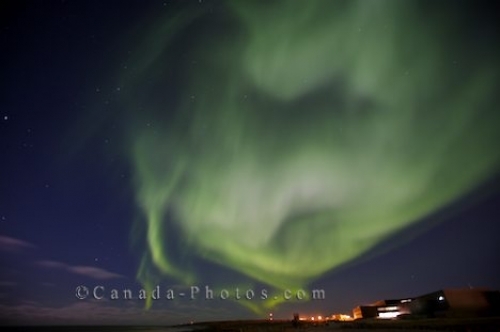 Northern Lights, Aurora borealis, above the town of Churchill, Hudson Bay, Manitoba, Canada. Picture of a stunning display of Northern Lights overpowering the lights that shine from Churchill, Manitoba.